There was some spirited competition among some 11 boat captains and their crews in the Albion Country Club’s “float-a-boat” contest on Labor Day, Monday, Sept. 5. 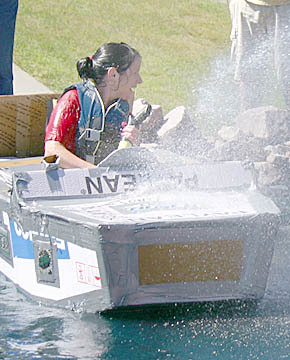 The boats were well-made, with inventive use of cardboard and duct tape, and outstanding “floatability.” It took about one hour and 45 minutes to determine the contest winner, which turned out to be Tonya Hunt (above) and her crew of Brian Luettel, Steve Grape and Jason Hunt. More photos and complete details in the Sept. 7 Albion News Print & Electronic Editions.